Hungarian deputy and journalist; born at Satoralja-Ujhely, Hungary, in May, 1851. He completed his school career partly in his native city and partly in Kaschau, and then took a course in law and philosophy at the University of Budapest. While still a student he entered upon a journalistic career, contributing leaders to the "Ellenör." In 1874 he became one of the founders of the "Egyetértés," the representative organ of the extreme opposition, the so-called Independent party; and he has been on its editorial staff ever since. In 1878 he was nominated as deputy for the district of Gyoma, being warmly recommended by Louis Kossuth, but failed to secure election. In 1881 he was elected deputy for the city of Miskolcz. During this period sprang up the celebrated Tisza-Eszlár blood accusation, which gave rise to an intense anti-Semitic agitation. Mezei made the affair the basis of an interpellation addressed to the minister of justice, which called forth exciting scenes in the House of Deputies. During the consideration of the bill on mixed marriages between Christians and Jews he made several pointed speeches against the anti-Semites. 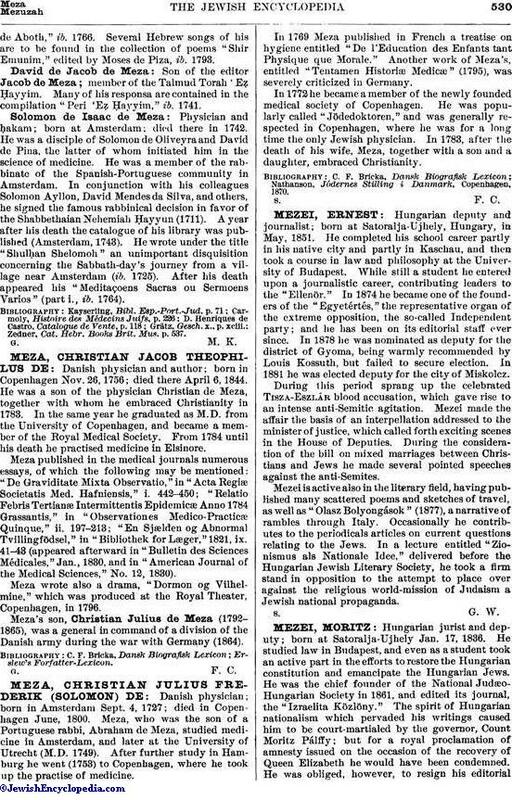 Mezei is active also in the literary field, having published many scattered poems and sketches of travel, as well as "Olasz Bolyongások" (1877), a narrative of rambles through Italy. Occasionally he contributes to the periodicals articles on current questions relating to the Jews. In a lecture entitled "Zionismus als Nationale Idee," delivered before the Hungarian Jewish Literary Society, he took a firm stand in opposition to the attempt to place over against the religious world-mission of Judaism a Jewish national propaganda.